It's with a heavy heart that I share this news. We have to find Tank a new home. He bit Kyle last week, and this is third time this has happened. I don't trust him around the kids anymore and I'm afraid the next bite is going to cause serious damage to Kyle or Hayden. Plus, it could possibly lead us to having to put Tank down. We have talked to our vet, two trainers and our friends at the Utah Friends of Basset Hounds to figure out the best scenario for Tank dog. Selfishly I want to keep him because I've grown quite fond of the fat basset but it's just not the right environment for him. He needs to be in a home without kids, and where he can be the center of attention. I feel like I'm giving up on him and a failure, but in the end I know this is the right thing to do even though it's going to be hard letting him go. He truly is a great dog but just needs to be in a place where he can be spoiled rotten. He just needs a loving home. 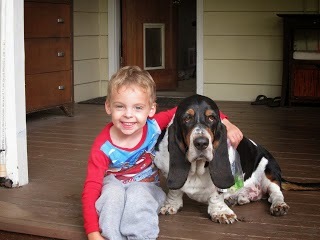 If you know of anyone that might be interested in a 6-year-old basset hound, please let me know. I would love to keep in the Boise area so I could come over and say hi every now and then. Otherwise, he's going back to Utah this weekend. It was a highly recommended trainer that our vet told us about. I spoke to her for about an hour. I even made it through the conversation without crying. After she heard it all, she thought Tank, as well as the Shifley family, could be trained so we can be one happy family. It's not going to be easy but she feels we are his best chance and no one is going to love him like we do so we are going to give it a shot. We also have to treat him like a dog and not like the middle child because as it turns out, he is a dog. Wish us luck and thank you for your support. It has been an emotional roller coaster the last 10 days but hopefully we can make this work so this is Tank dog's forever home. At least one of them was excited about the news. I hope it works out for you five. Good luck on it. I'm rooting for all of you and if it works, it will be worth it. He deserves a chance and I'm glad someone will be able to give him one. Ohhhhh I hope Tank gets to stay! I'm so glad you are all willing to take the steps to fix the issues. Tank sure seems like he's worth it. Good Luck! Some dogs can't cope with getting older, a bit like us really. I do hope you are able to keep him and give him the love he needs. Good luck, Matt. Yes. I truly do hope this can work out. "We have to treat him like a dog because as it turns out he is a dog." That is so funny and so true. Dogs become such a part of our families with personalities all their own that we "forget" they are not persons. I hope it works out for the best. And I'm sure it's true that no one is going to love the Tankster more than the Shife Family. ruby bit several people and it was always the same. they put their hands out to pat her too quickly and she felt threatened. with ruby you had to approach her slowly and have your hand lower than her eye level. when we moved last year she bit the real estate agent. that might be my fondest memory of the old girl. i'm pretty sure you can work around tank's accidental biting. i was turned down by a pitbull rescue shelter a few weeks ago because i failed the interview.